A switchback turn on the west side of Wolf Creek Pass about 18 miles east of Pagosa Springs on U.S Highway 160 is one of the more dangerous areas on the mountain pass with a 200-foot dropoff on the other side of the curve. 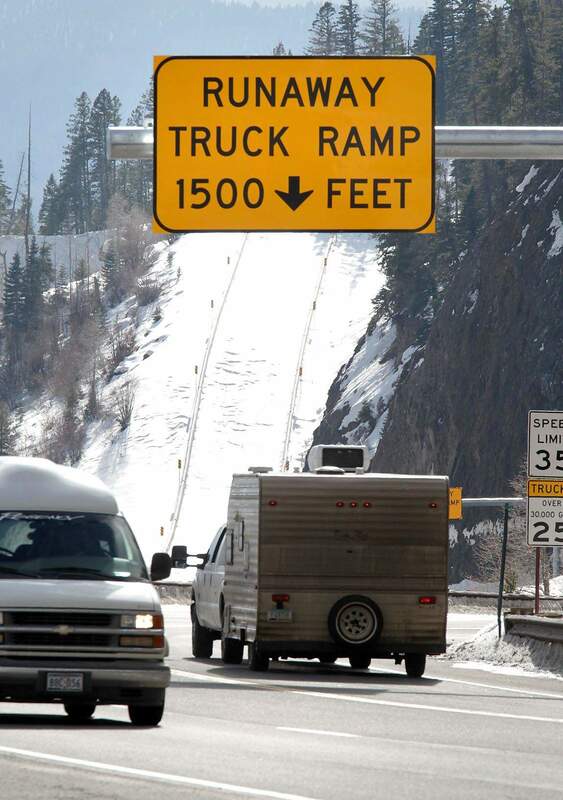 Three runaway truck ramps on Wolf Creek Pass offer a bit of safety to truckers on the road. 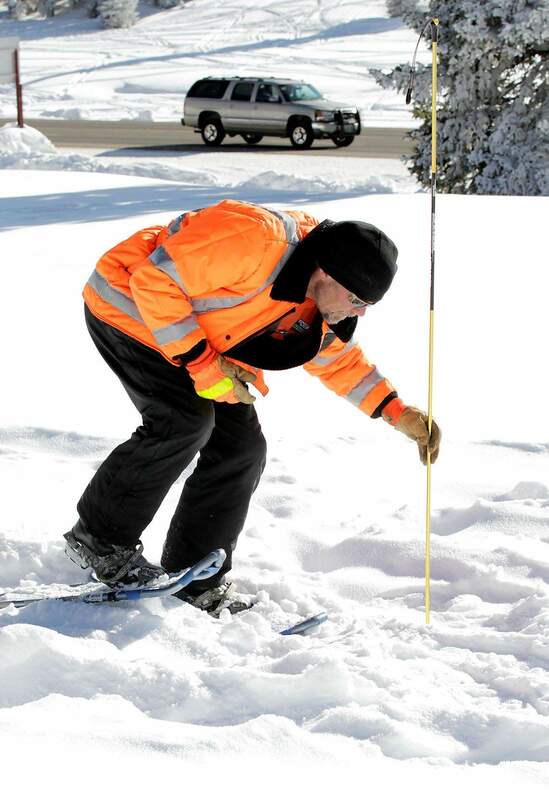 Marcos Katsos, with the Colorado Department of Transportation Patrol 18, probes the snow at the Avalanche Training Park at summit of Wolf Creek Pass while searching for a buried piece of wood with a beacon on it during avalanche training for plow drivers and Colorado State Patrol officers. 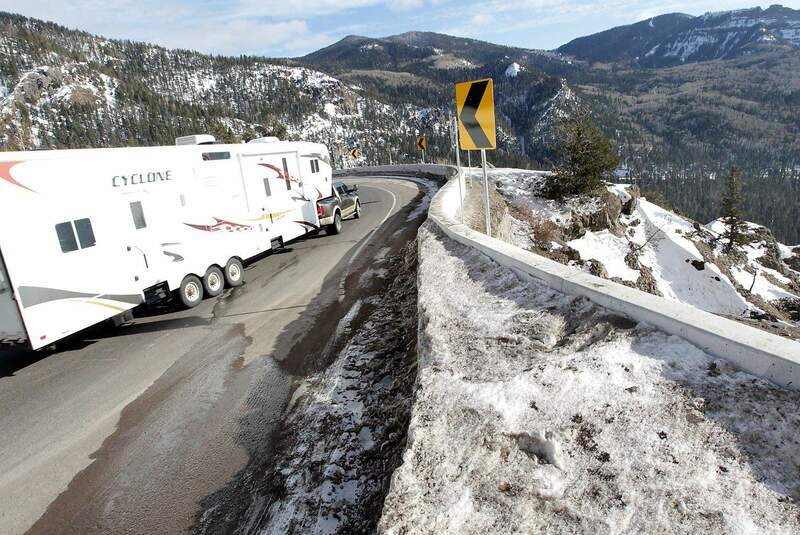 Wolf Creek Pass is listed as one of the most dangerous mountain passes in Colorado. 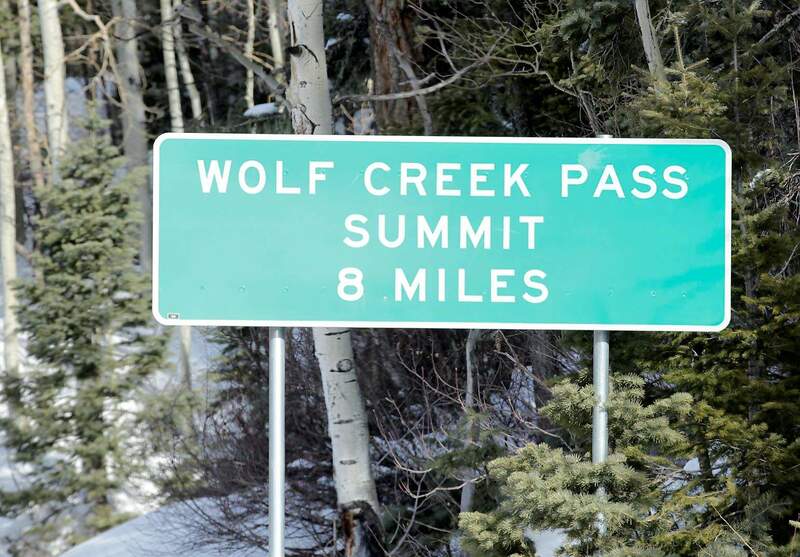 As motorists reach the summit of Wolf Creek Pass, signs warn them of the long steep descent they will encounter. A switchback turn on the west side of Wolf Creek Pass is one of the more dangerous areas on the mountain pass with a 200-foot dropoff on the other side of the curve. Anyone who has spent a winter in western Colorado has been there: wheels spinning on the ice, no visibility past the hood and miles of 7 percent grades to the bottom of the hill. Jaws are clinched. Fingers strangle the steering wheel. But survival brings a story to be told over and over to those timid souls who will never know the exhilaration of a white-knuckle drive over one of Colorados famous mountain highways. Now, Four Corners denizens can brag about surviving not just a bad mountain drive, but the worst drive Colorado has to offer. Seized by the journalists desire to categorize, quantify and rank everything, the Herald assembled a list of Colorados paved, year-round mountain passes and rated them on all the problems that make winter driving such a scare: snow, switchbacks, steepness, traffic, elevation, distance from help and frequency of accidents. The winner: Wolf Creek Pass. 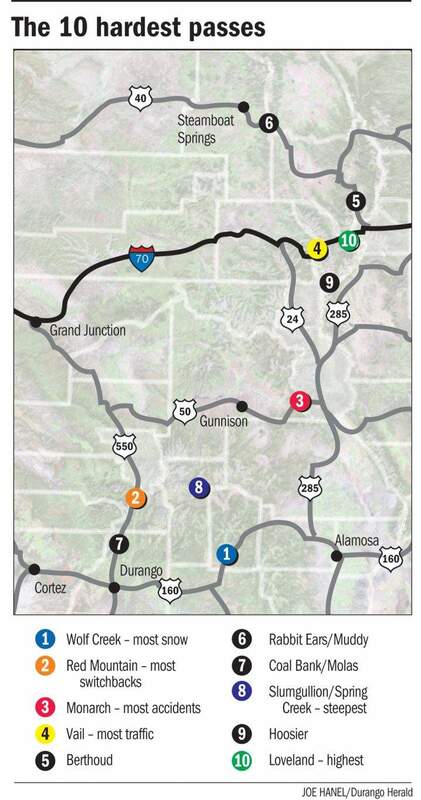 Red Mountain Pass was a close runner-up, and the Coal Bank/Molas duo ranks in the top 10, so Durango drivers are hemmed in from the north and the east. Its journalistic pseudo-science in all its glory, but who could doubt the ferocity of Wolf Creek Pass? After all, it was immortalized in a country music song (C.W. McCalls 1974 narrative about hauling a load of chickens over the pass). You better slow down or you gonna kill us. Just make one mistake and its the Pearly Gates for them eight-five crates a USDA-approved cluckers, McCall sang. Kevin Chavez takes Wolf Creek Pass seriously. Chavez is the patrol leader of the Colorado Department of Transportations Patrol 18, the snowplow platoon that keeps the states snowiest pass open. Harsh storms can induce vertigo even in veteran plow drivers, Chavez said. The wind is just blowing the snow, and its snowing so hard you think youve stopped, but your mind thinks youre still moving, he said. Heavy snow helped vault Wolf Creek into the No. 1 spot on the Heralds list. But Wolf Creek was not the leader in arguably the most important category: the accident rate. That honor, or dishonor, goes to Monarch Pass, between Gunnison and Salida. The pass averages more than one crash per week. Curtis Eisenhauer has pulled many of those wrecked cars and trucks off the pass or out of its ravines. As the owner of Dottys Towing and Repair on the west side of Monarch Pass, Eisenhauer has seen some scary situations when trying to clear out a jackknifed semi from an icy road. Many of the speedsters are veteran mountain drivers who should know better, he said. 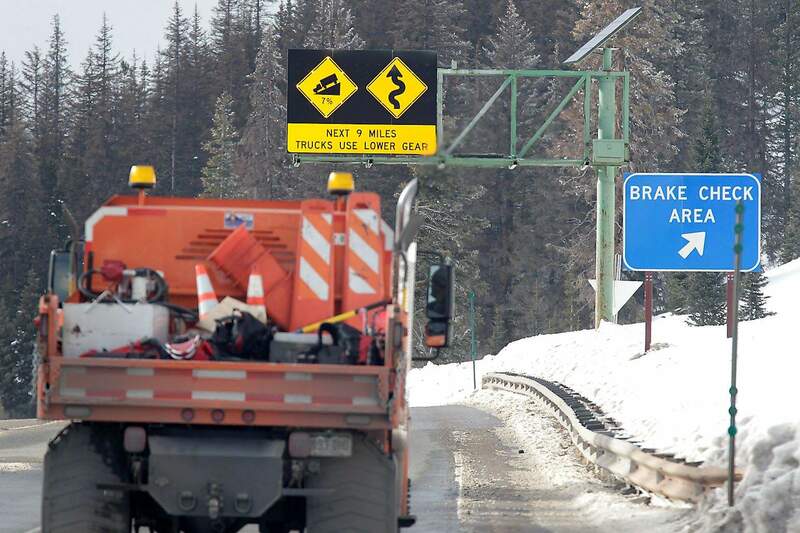 Keeping safe on the most dangerous passes is mostly just a matter of common sense, according to CDOT: slow down, dont use cruise control, give plows extra room and make sure your tires have enough tread. For the professional plow drivers who hit the roads in the worst conditions, theres another worry. 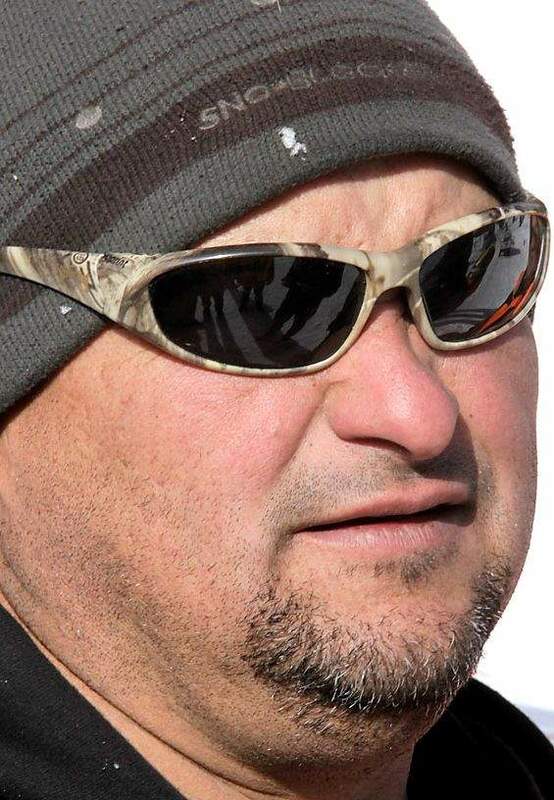 Avalanches are the biggest fear of George Hudran, supervisor of the Wolf Creek plow patrol. The week before Christmas, his team went to the Wolf Creek Avalanche School at pass summit to practice using the beacons the drivers carry in case they are buried in a snowslide. Hudran gets frequent avalanche forecast updates from the Colorado Avalanche Information Center. This winter so far hasnt been bad. It is nothing like 2007-08. But as his crew practiced avalanche safety atop Wolf Creek Pass under a perfect Colorado-blue sky next to evergreens dusted with snow, Hudran says hes glad he stayed. Joe Hanel crossed six passes in one day to report this story. To determine the worst mountain pass in Colorado, the Herald assembled several bits of data into a spreadsheet. The Colorado Department of Transportation provided a list of 30 passes. Only year-round passes were counted. (Sorry, Aspenites, Independence Pass doesnt make the cut.) Raton Pass was not included because half of it is in New Mexico. CDOT spokeswomen Stacey Stegman, Nancy Shanks and Mindy Crane also tracked down data on elevation, steepness, traffic, accidents from 2009 to 2011, chain-law days in 2011 and closures in 2011. We counted switchbacks using Google maps and calculated the distance to the nearest town using CDOT data and Google maps. Real-time snow data is hard to find, so we used the average April snowpack over the last four years from the nearest U.S. Department of Agriculture Snotel station. Sometimes Snotels are right on the pass, but others are several miles off the road. Chain-law and closure data was incomplete, so we gave each category half the importance as the other variables. A little bit of computer-assisted data crunching later, and presto: We can call Wolf Creek Pass the most white-knuckle-inducing drive in Colorado. 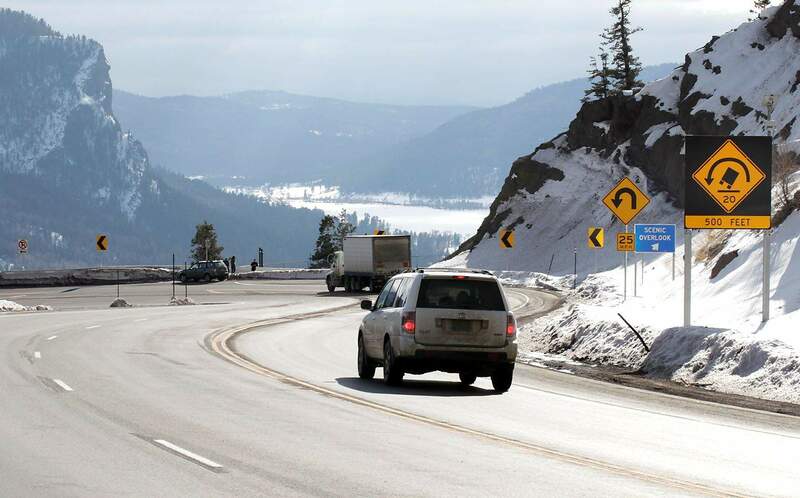 Worst odds for a wipeout: Monarch Pass  An average of 60 wrecks in the last three years makes this steep and high road between Gunnison and Salida your worst bet. Find better odds on Loveland Pass, which averages more than 100,000 safe trips for every mishap. Every day is a winding road: Red Mountain Pass  With 15 switchbacks between Silverton and Ouray, the Million Dollar Highway changes directions more often than a politician in an election year. Bumper-to-bumper blues: Vail Pass  Ski weekend drivers on Vail Pass sometimes feel like theyre stuck behind 10,000 cars. And theyre right. Its the only pass on our list on an Interstate. Snow king: Wolf Creek Pass  Wolf Creek Ski Area brags that it has the most snow in Colorado, so its fitting that the road wins top honors in this category. Top of the world: Loveland Pass  With a high point on the Continental Divide just under 12,000 feet, its no wonder why they built the Eisenhower Tunnel below to connect the mountains to Denver. Loneliest journey: Cameron and Cochetopa passes  Need to get away from it all? Cameron Pass leaves Fort Collins and climbs into sparsely populated North Park. Cochetopa winds from the even-sparser San Luis Valley to Gunnison. First gear all the way: Slumgullion Pass  A top grade of 9.4 percent on this road between Lake City and Creede will test any vehicles cardiovascular system. As an aside, this is where Alfred Packers companions met their unappetizing demise in 1874. But the advent of modern transportation has greatly reduced the risk of cannibalism.